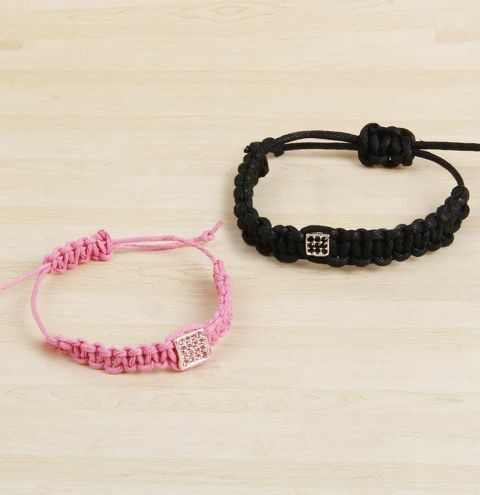 *SALE MAKE* Make lots of neat Macramé bracelets with our discounted cords and give your bracelet some sparkle with premium Shamballa slider beads! Find more cords and beads on sale at The Biggest Clearance Ever! Cut two lengths of cord. One approx. 60cm and the other 1m. Secure the shorter thread from top to bottom on your Macrame board. Take the longer thread, find the middle and tie it to your central cord a third of the way from the top of your board. This completes 1 square knot. Repeat until you have approx. 2 inches of knots. Thread on a bead to the centre cord and create half a square knot around the bead. Contine to make more knots until you have approx. 2 inches. Once you have finished the last knot, move your work onto a paper surface and carefully apply a tiny drop of glue where the tail threads come out from the knot. Allow to dry before trimming away the tail threads. Take the ends of the centre cords, lay them side by side and then do a macramé braid (0.5-1 inch) for your sliding knot.Secure the ends with a drop of glue, being careful not to glue the sliding knot to the centre cords running through it (otherwise it will not be able to slide and adjust). Try gently pulling the centre cords through the sliding knot while the glue dries. Tie each tail ends in a knot to stop it sliding through the macrame knot.